The opening ceremony of a new Cruyff Court was held afternoon in Les Roquetes (Sant Pere de Ribes), the result of the collaboration between the Barça Foundation, the Cruyff Foundation and "la Caixa" Bank Foundation, which aims to promote sport as a means of social inclusion and cohesion. The Cruyff Court at Les Roquetes is the sixth of the fifteen that will be opened in Catalonia as a result of this arrangement. Ronaldinho is the patron of this initiative in this town in the Garraf region and joins other Barça players and former players, such as Hristo Stoichkov, Sergio Busquets, Carles Puyol and Gerard Piqué, who are involved in different Cruyff Courts in other towns in Catalonia. Cruyff Courts are small free-to-use football pitches that encourage the practice of sport among vulnerable children, and are designed to transmit such values as responsibility, respect, inclusion, teamwork and education in healthy habits. The event was presented by journalist Edgar Fornós, who handed over to Jordi Cardoner, first vice-president of FC Barcelona and the Barça Foundation, Abigail Garrido, mayor of Sant Pere de Ribes, Pati Roura, director of the Johan Cruyff Foundation, and Xavier Bertolín, director of the Department of Commercial and Educational Action for "la Caixa" Bank Foundation. 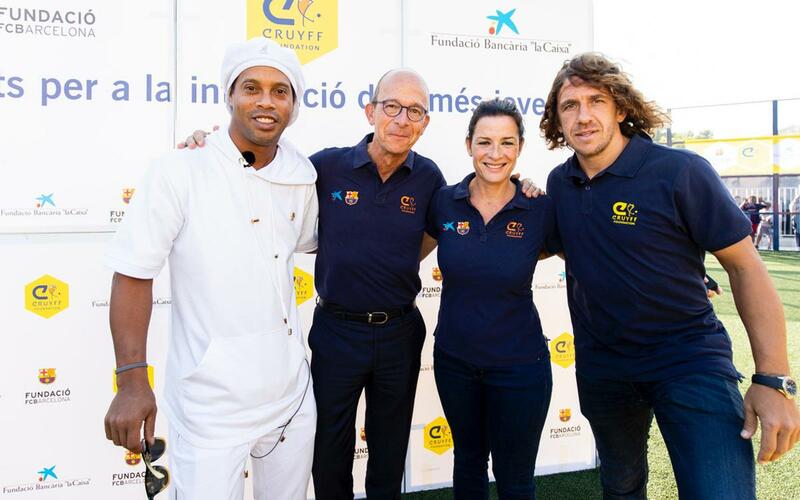 At the end of the speeches, Fornós interviewed Carles Puyol, as a patron of the Johan Cruyff Foundation, and Ronaldinho, as the patron of Cruyff Court in Les Roquetes. The press conference then gave way to an opening match that gave the children in attendance the chance to share a few moments of football with the two Barça legends. When the game was over, Ronaldinho and Carles Puyol signed autographs for the schoolchildren.